There is no denying that the Financial Technology sector is on the rise. As the companies start maturing and certain outliers build credibility with big raises the investors will continue to flock. ACE Portal’s Co-Founder and CFO, Carl Torrillo, interviewed Ross Barrett, Co-Founder of VC Experts, on the trends in financial technology (fintech) investing, valuations, and average investment size. Take a moment and see what trends are shaping this industry. Incase you missed our Fintech Overview Report feel free to take at look at it here. Can Business Judgment Review Combat Stockholder Litigation Challenging MA Deals? In KKR Financial Holdings LLC Stockholder Litigation (Oct. 14, 2014), the Delaware Chancery Court has continued its march to the drumbeat of business judgment deference. In a putative class action by shareholders of KKR Financial (KFN), who were claiming breach of fiduciary duty by KFN’s board in having approved a $2.6 billion merger with private equity firm KKR, Chancellor Andre Bouchard found that KKR had not been a controlling stockholder of KFN– because KKR held less than 1% of KFN’s voting power and had no right to appoint or remove directors or block board actions, even though KKR had “total managerial control” of KFN. The Chancellor also found that KFN’s directors had been independent of KKR (even though they had been nominated by and had various ties to KKR); and that KFN’s merger proxy statement had provided for a fully informed stockholder vote. The court applied business judgment review and dismissed the case at the pleading stage. Are massive valuations just a marketing ploy? Are VCs letting these late stage companies pick the valuation as long as the company agrees to their terms? These unicorns become media darlings because of their astronomical valuations; it seems like lipstick on a pig. Bill Gurley is right in this blog post from TechCrunch, there is a lack of due diligence and the cycle will continue to produce the overvalued company, they will go through the “financial root canal” with their S-1, and we will all wait for the next unicorn to dance across our screens. Read the full article: Startups, Late-Stage Valuations, And Bull | TechCrunch. Fenwick & West LLP analyzed the terms of 150 venture financings closed in the fourth quarter of 2014 by companies headquartered in Silicon Valley. Valuation results continued very strong in 4Q14. Up rounds exceeded down rounds 79% to 6%, with 15% flat. This was an increase from 3Q14 when up rounds exceeded down rounds 76% to 12%, with 12% flat. The Fenwick & West Venture Capital BarometerTM showed an average price increase in 4Q14 of 115%, an increase over the 79% recorded in 3Q14, and the highest amount recorded since we began calculating this statistic in 2005. The median price increase of financings in 4Q14 was 61%, an increase from the 43% registered in 3Q14. The software industry again led all industries with 50% of the deals and the highest median price increase, while internet/digital media had the second largest percentage of deals and the highest average price increase and highest percentage of up rounds. The hardware industry also had very good returns and the life science industry had solid returns. We note that the valuation strength was seen across series, and that investor favorable terms such as senior liquidation preference were used relatively infrequently. 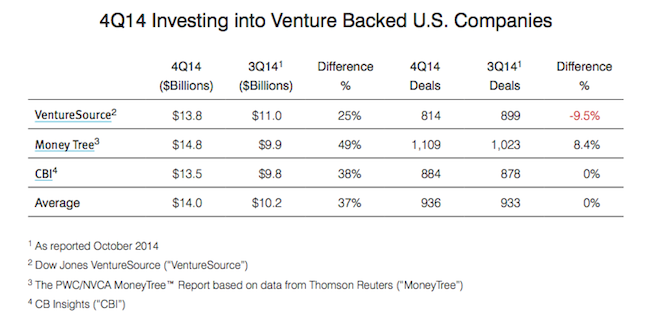 Venture capital investment in U.S. companies (in dollar terms) increased significantly in both 4Q14 and for the full year of 2014. However, the number of venture deals was effectively flat for both the quarter and the year, as deal size increased. A summary of the results published by three leading providers of venture data is below.